What happens when you give Batman a Green Lantern ring? Yes that particular concept has been explored several times but what if Bruce Wayne was….EVIL! If you’re reading this review then there’s a good chance you’re reading Dark Knight’s Metal and you might be wondering what is the deal with The Batmen of The Dark Multiverse. This one shot explores what happens when a power ring meets overwhelming will power. Warning they’re will be spoilers going forward you have been warned. Read your comics people! Unlike most fans of Marvel and DC I generally tend to stay away from one shots when they are part of a huge event. The creators stress these days that you only need to read the core series to understand everything and thankfully that is true in most situations (looking at you Secret Empire). Before I picked up this issue I was curious as to whether it would play a vital role as part of Dark Knights Metal or will it be a self contained one shot. 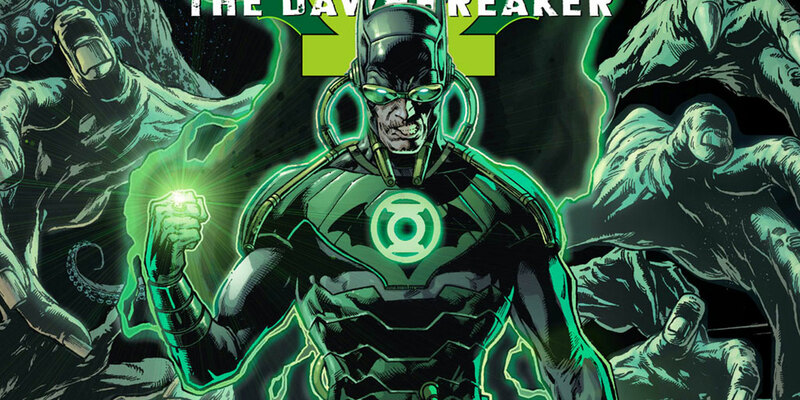 Thankfully Dawnbreaker leans more to self contained than necessary read. I would honestly say that if you are not reading Dark Knights Metal but wanted to read about a demented Bruce Wayne with a Green Lantern ring you’ll be mostly satisfied. The only downside is that once this one shot ends, you most likely won’t get much development about this particular version of Bruce Wayne. As for the story itself, part of me really enjoyed the morbid path that Earth-32 Bruce takes to becoming a Green Lantern. It starts with the murder of Thomas and Martha Wayne (pretty standard if you ask me), and in that moment Bruce basically snaps and gets a Green Lantern ring due to him overcoming his fear of losing his parents. Given his emotional state, I completely understand why Bruce at such a young age would commit murder however after that I feel that the issue takes a leap in logic. I would have preferred a slow decent of madness instead of the zero to sixty miles per hour approach this comic takes. Yes I understand that’s a one shot and you only have a certain page count to work with but a simple page of the people he’s killed but instead we’re only told and not shown. Humphries implies that time has past but when I look at Bruce Wayne talking with Commissioner Gordon he looks slightly older than the previous panels. If he looked older I might be able to buy the hint at the passage of time but sadly this is one aspect of Van Sciver’s pencils that hurt the comic. Finally I understand that the crux of this event is that evil versions of Batman are invading our multiverse but the moment that this Bruce Wayne throws away the mantle of Green Lantern to become Batman felt extremely forced. Despite my one critic of Van Sciver’s art, his work on this issue was once again amazing. I really appreciated how Van Sciver captured the morbid tone of the book with his excellent use of shadows and violent imagery. It’s important to note that this book isn’t a gore fest from start to finish but when moments of brutality do occur it has impact to the story because other instances are either off panel or use shadows to hide them. It was honestly refreshing to see Van Sciver’s art in a different setting, yes his style remains unchanged but everything around his stellar artwork. Dawnbreaker was an enjoyable read even though I did have more than a few gripes about it. Even though you could consume this issue without reading Dark Knights Metal you’ll get a bigger enjoyment out of this one shot.